While many in the social media business hang on every Gartner Magic Quadrant or Forrester Wave, doesn't this seem a rather unsocial way to evaluate social solutions? Sure, those research firms do a very thorough and objective job of assessing the platforms, but their approach is akin to the Golden Globes (which only has 93 voting members) in an era when million of reviews can be found on sites like Rotten Tomatoes, Yelp and TripAdvisor. 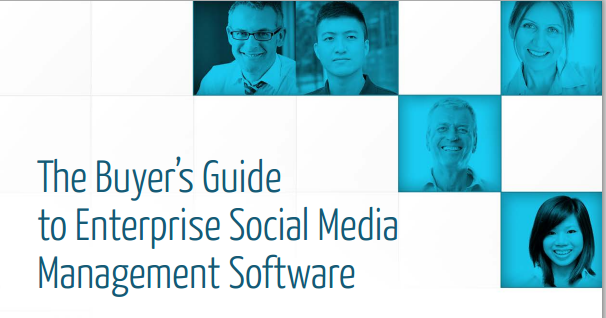 For a more social perspective on the strengths and weaknesses of Social Media Management Software (SMMS), TrustRadius has released its free report of crowdsourced evaluations. The TrustRadius Buyer’s Guide includes a detailed review of products by use case, culled from more than 400 authenticated end-user reviews of 23 social media management products. TrustRadius's latest report is structured in a very smart way that accounts for the three predominant use cases for enterprise social media: customer care, social intelligence and marketing. "Social media programs are now enterprise-wide and no longer confined to marketing," notes Vinay Bhagat, CEO of TrustRadius. Out of the 23 SMMS platforms evaluated, all laid claim to being a marketing platform, and for the most part, users agree, with end users mentioning 21 of the vendors in terms of marketing solutions. The outcomes for the other two use cases were far less uniform: Nineteen of the platforms identified themselves in the listening space, but users agree for only eight of those platforms, and 17 of the SMMS companies associated themselves with the customer care use case, but users only identify seven in this category. The TrustRadius report defines some of the special needs for social customer care, such as the ability to view entire customer interaction histories and integration with CRM systems. The Buyer's Guide notes that Brand Embassy, Conversocial, Hootsuite Enterprise, Lithium Social Web, Spredfast Conversations, Sprinklr, and Sprout Social offer "true high-volume, enterprise examples of social customer care, based on statements in reviews on TrustRadius." The report includes comments from enterprise leaders addressing how these platforms help them resolve the unique needs of customer care in social media. For example, David Tull, customer engagement manager at JackThreads, reports that "Conversocial allowed us to work 7-10X faster than we had previously," and Comcast's Bill Gerth notes that "Within five months of launching Lithium Social Web, we were able to justify a 30% increase in staffing through the use of clear and concise operational reporting." The TrustRadius Buyer's Guide guide identifies two dozen features that organizations seek when selecting an SMMS for social intelligence. It also conveys some specific user insights about the best platforms for this use case, including Attensity, Brandwatch, Netbase, Radian6/Salesforce Social Studio, Sprinklr, Sysomos and Viralheat. For example, Will Hall, digital analyst at Waggener Edstrom, says, “Brandwatch has given us a quantifiable way to prove ROI to our clients. The TrustRadius report notes the distinction between the marketing use case and the other two: "Whereas customer care is focused on using social media to engage with customers and resolve issues on their terms, and social intelligence is focused on leveraging the vast amount of conversations available in social media for various business purposes, social marketing is generally about using social media for brand amplification." For the Marketing use case, TrustRadius identifies eight separate use case definitions and matches each platform's claims against user observation. For example, almost all platforms claim to assist with Lead Generation, but only two--Salesforce Social Studio and Viralheat--are mentioned by users for this need. Other marketing categories that TrustRadius includes are Community Management, Publishing, Campaigns/Promotions, Influencer/Advocacy, Content Marketing/Curation, Analytics/Optimization and Paid Media Management. Many of the platforms receive attention in the Social Media Marketing section of the Trust Radius Buyer's Guide. HootSuite and Sprinklr are the two that stand out in terms of scale (which TrustRadius measures by page views on their platform and number of evaluations submitted). A social media and IT manager at a digital agency says of Hootsuite Enterprise, "The detailed analytics package not only lets us see how our campaigns are performing, but it also allows us to share detailed metrics with our clients to justify the fees we charge them." And of Sprinklr, Frontier Airlines' Justin Macauley notes, "A big issue for us is understanding when to segment messaging through geo-targeting and when to push out blanket messages. Sprinklr has allowed us to test many different scenarios and to better understand what kinds of messages work best for what kinds of offers." None of these five are among the most rated SMMS solutions. The two most-rated are Sprinklr and Hootsuite, and both score above-average ratings. 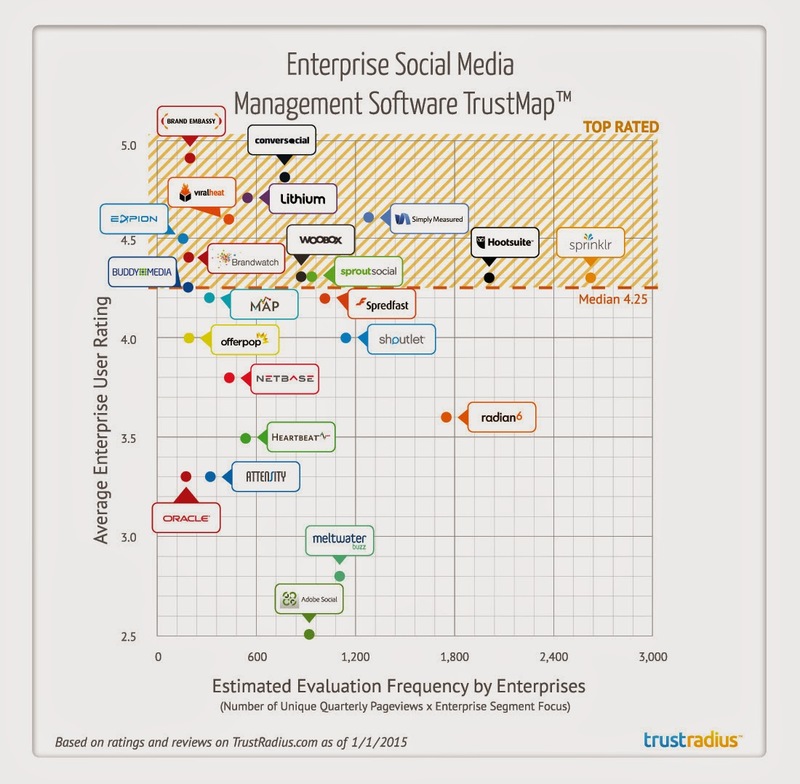 Among TrustRadius's findings was that three-quarters of companies use more than one social media management platform. Moreover, of those who use more than one tool, 14% actually use six or more. To access this helpful and detailed 102-page report, visit https://www.trustradius.com/guides/sm.